The film follows writer Jonathan Franzen as he goes to Europe to look into the poaching of songbirds. 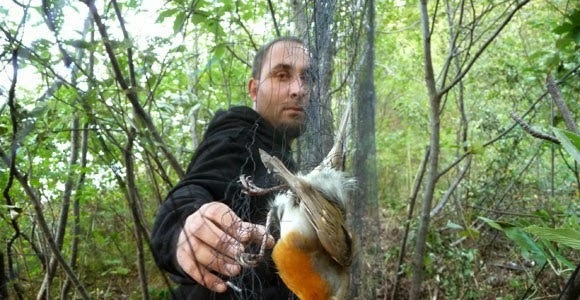 Songbirds are on decline in Europe thanks to their being viewed as a delicacy by many people. The catching of the birds were outlawed in 1979 because of population declines, however poachers still make a living catching the birds for restaurants. The film follows Franzen as he travels around the Mediterranean with a bunch of men who seek to stop the poaching. Good, but unremarkable film suffers because it never quite grabs you. Yes the men doing the protecting are a bunch of characters with the stalwart Andrea as their leader, and you care for them and their cause. The problem is that the film itself never reaches above the level of a really good PBS documentary. There is nothing here that makes the film stand out. I've seen several other films on bird poaching over the last few years, including the excellent Feathered Cocaine, which some how made things a bit more exciting and urgent.